Leap Year! Let's leap into March. I was so excited when I found these Cobalt Blue Shrub Glasses at Tuesday Morning. They are so interesting in shape and history. Mrs. E. Smith's Complete Housewife published in Williamsburg in 1742 , describes shrub as a citrus punch. It was made with oranges or lemons, spiked with rum or brandy, and sweetened with sugar and spices. This glass is interpreted from various 18th-century English examples in the Colonial Williamsburg collections. Its shape echoes the short, sturdy "firing" glasses used in taverns, but its more delicate glass bowl is akin to wine glasses. I took some table setting liberties today. I decided to put the tea cup at the top of the plate. I think the tea cup belongs next to the spoon on the right side of the plate. I do believe I have the glass in the proper place. We had the first sign of winter yesterday. Wild winds and cold weather. I'm anxiously waiting for Spring to arrive. This little miniature white rose is going to be planted in the garden this weekend. I have several miniatures and they are going to find a new home in the pergola garden. The tablescape is simple with the focus on the unusual shape and color of my SHRUB glasses. The dessert dishes and cups and saucers are Delft. I purchased them at the antique store where I rented space for My Cozy Corner a few years ago. 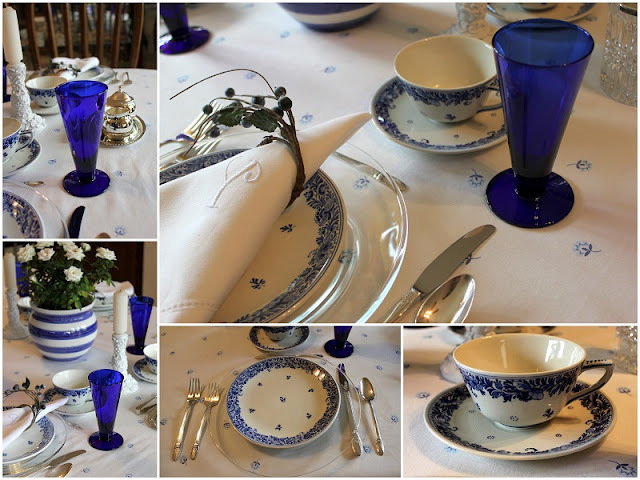 The clear glass dishes show off the blue and white tablecloth nicely. The relaxed versatility of blue and white ensures a harmonious blend of styles. Linen napkins with my monogram and charmed accoutrements with the color of tranquility, blue and white is the perfect choice for afternoon tea-time. Always a mosaic or two. I love the versatility of designing a mosaic. I will be joining some special parties. Please link back. Your Delft set is delightful as is your entire table. Everything so lovely. Monogram Napkins :sigh: and the colors and the setting so peaceful and warm. I love your blue and white. Your candle holders are gorgeous!! A beautiful table! So so pretty, just absolutely love the blue! I used my First Love this week also! Such pretty dishes and I adore your tablecloth. Great candle holders too. Oh, I'm such a fan of blue and white. Yours looks fabulous. Love those shrub glasses. Neat to know the story behind them. Another blue and white fan here! I love the tiny little blue flower in your tablecloth and how the glass chargers let it show through. 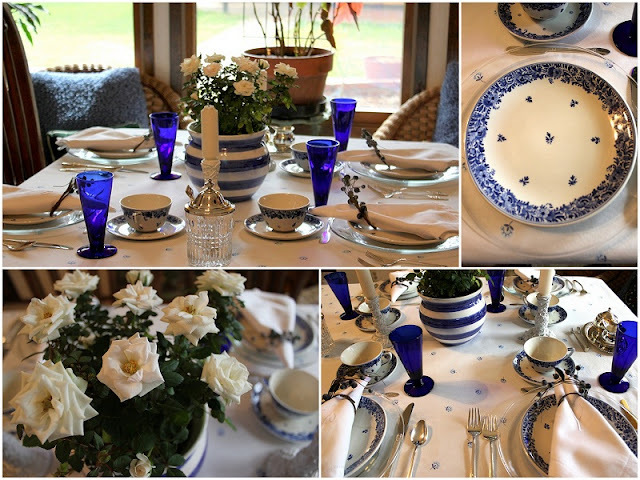 There is nothing prettier than a blue and white table. I wondered what those glasses were called, now I know, thanks to you, Betty! Lovely roses. Beautiful table - I love blue and white dishes. Thank you so much for sharing with Home and Garden Thursday!